The McMaster Marching Band (MMB)﻿, established in 2009, is one of few university marching bands in Canada. Composed of brass, woodwinds, and marching percussion, MMB is proud to showcase the musical talents of students studying at McMaster in a unique and fun way. 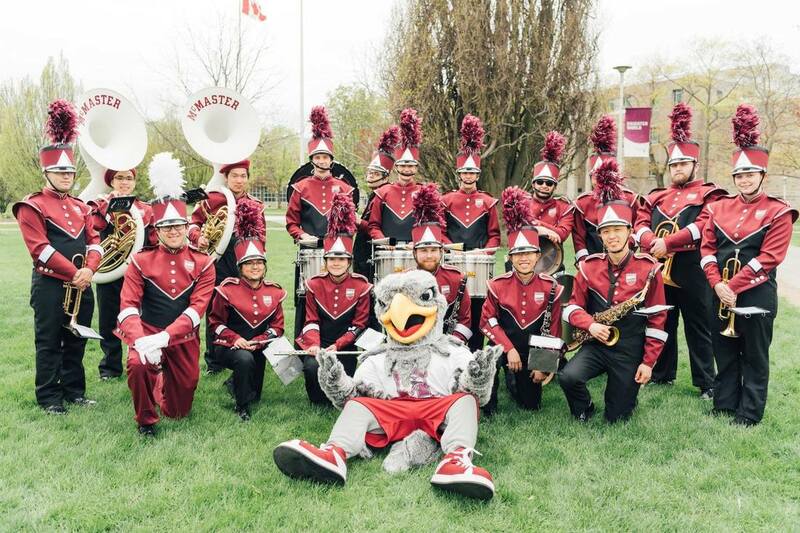 MMB is active on campus and endeavours to embody school spirit at varsity games, in addition to special events in collaboration with the McMaster Students Union (M﻿﻿SU) and other University organizations. The Band also bridges the gap between McMaster University and the Hamilton community, performing at various local events including the annual Hamilton Santa Claus Parade. As a band, we have been selected to perform at a number of high-profile performances such as the Toronto Santa Claus Parade annually, the largest Christmas Parade around the world viewed by more than one million people every year. We have also performed at the St. Patrick's Day Parade in Montréal 2012-2017. Most notably, the MMB has performed alongside Serena Ryder in the ET Canada New Year's Eve 2014 Bash (televised nationally), during the Toronto Raptors Holiday Halftime Show 2017 against the 76ers, and taking part in the cast of the upcoming IT Chapter II movie.